As I’m sure you know, we love our pizza here. Somewhere on Twitter recently we heard about a small vendor in the Grainger Market selling “pizza by the slice” and that it was very, very good – so it would have been wrong to not check it out! In the top end of the Grainger Market, aisle 4, (you might even miss it going past it), sits a small stand selling three or four flavours of pie, all by the slice. 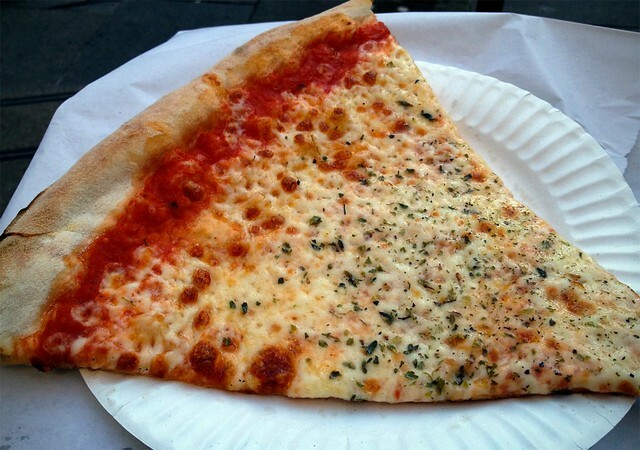 A fairly foreign concept to UK customers – here we are used to ordering the whole pie, but by the slice is typical of NY-style pizza, which this is not a world away from. Slices are large, and range from £1.70 – £1.90 depending on toppings; very reasonable given how filling these can be. Two slices lasted me all afternoon. Real pizza lovers know that margarita is where it’s at (pictured below), so we went straight for it. These pizzas are obviously cooked very quickly, the traditional way, and then when you buy a slice, they are warmed back up to temperature for you. The margherita is classic – no messing about, just dough, cheese, sauce, and herbs. It looks good and, wow, tastes great. We spent most of last year banging on about how great The Waterline pizza is – we have a new challenger to the throne here. 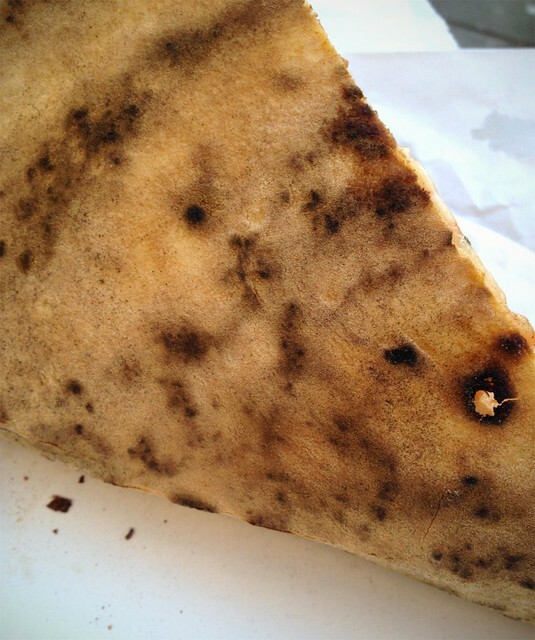 The base/crust/cornicione is spot on (see photo below). It’s charred, crusty and springy at the same time, and unlike the duvets we are used to seeing this side of the Atlantic, very thin. Re-heating melts the cheese once more, and just warms the tomato sauce underneath. If we had one criticism, it’d be that the sauce isn’t quite sweet enough for our tastes (using San Marzano tomatoes? ), but otherwise, these are pretty spot on slices. 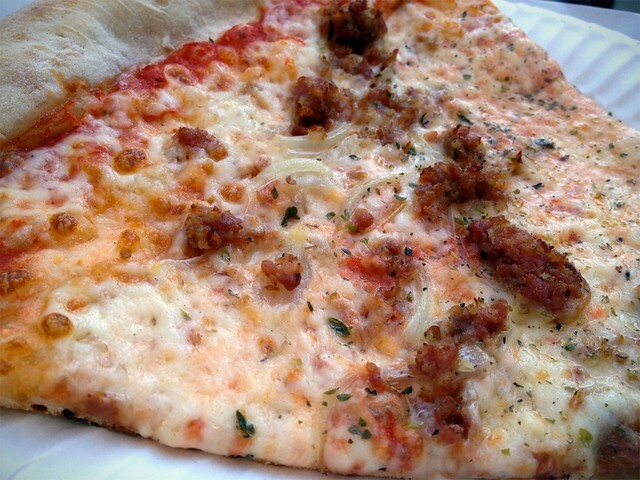 We also went for a slice of italian sausage (pictured), which was more filling, and the toppings were satisfyingly tasty and not overpowering. Pepperoni is also good. Whole pies are available for order, which are obviously going to cost a bit more, but a quick look on the Domino’s website reveals their large to be £11.99, minimum. It’s good to see the Grainger Market making a name for itself once again with some cracking scran and local producers, and we can definitely recommend Pizza by the Slice for anyone looking for a decent pizza at lunchtime. Anyone who has tried and tested real New York pizza, or pizza in Italy will know this is close to as good as you’re going to get. A cracking slice.